The “easy” pickings are the asteroids, because they are small enough not to require much fuel for a surface landing. The Moon and Mars, by contrast, need lots of fuel to safely touch down and later lift off. 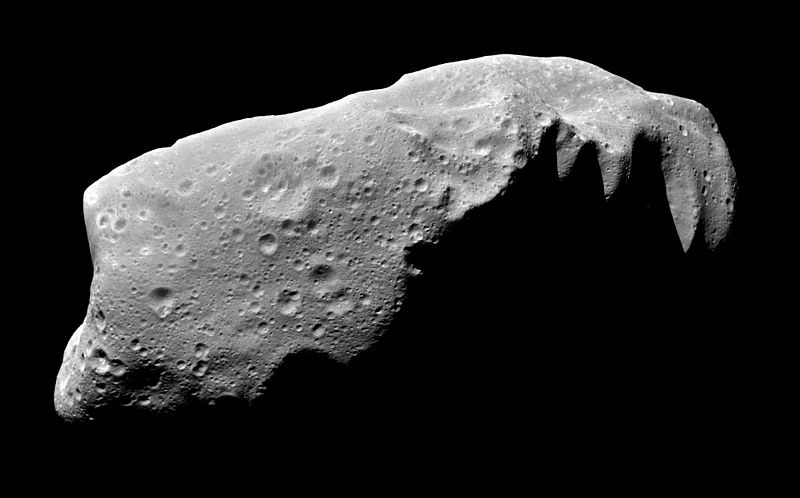 Most asteroids are basically rock. We have plenty of that stuff already. The prizes are the metal-rich iron-nickel asteroids, comprising 10% of the total asteroid belt mass, or about 3×1020 kg (1/20,000 of an Earth mass). By comparison, the world has an estimated nickel resource of 130 million tons (≈1011 kg). The Earth contains far more nickel than this, but most of it in the inaccessible core (as opposed to inaccessible space). Nonetheless, one iron-nickel asteroid 1 km in diameter would increase our current nickel resource more than ten-fold. It is indisputable that asteroids contain a trove of metals. 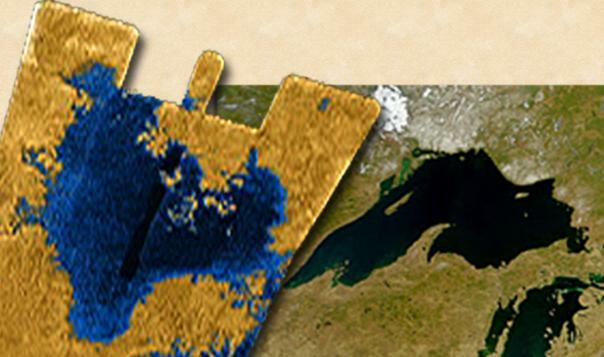 Titan Sea and Lake Superior, to scale. Likewise, our hydrocarbon endowment on Earth cannot compare to the enormous amount of methane contained in Jupiter. And there are lakes of methane on Titan—a moon of Saturn—that dwarf the hydrocarbon resources on Earth. Nobody guards them. Oxygen sold separately. Finally, folks speak of the helium-3 (³He) resource on the Moon at a trace concentration of about 10 parts per billion by mass. Such fuel could be useful in fusion reactors of the future. I will not address this option here, except to compare the energy density to that of fossil fuels. One gram of lunar soil has about 10−8 g of ³He, or about 3×10−9 moles, becoming 2×1015 particles. Reacting with deuterium, this process releases 18.6 MeV of energy, becoming 1.4 kcal/g. Compare this to coal at 4–7 kcal/g, oil at 10 kcal/g, and natural gas (methane) at 13 kcal/g. The energy density is not ridiculously small, but the resource is very diffuse, expensive to collect and deliver, and with no current application for its use. That’s why I’ll say no more here. How easy is it to get at these various extraterrestrial resources? Nothing but empty space stands between us. Once in space, how easy is it to zip about from one place to the other? It doesn’t seem too bad, judging from movies. A popular misconception is that once in space, we escape the grip of gravity. This is a natural intuitive leap if you have watched video of weightless astronauts in low Earth orbit (LEO). It turns out that gravity from Earth in LEO is still 90% what it is on the ground. The trick is that the orbiting spacecraft has tremendous sideways velocity, so that as it falls to Earth (yes, it is always falling! ), the ground curves out from under it so that it continuously falls around the Earth. It takes a velocity of 7.7 kilometers per second (17,000 m.p.h.) to pull this off. Because the astronauts fall at the same acceleration as the spacecraft (equivalence principle), they appear to be weightless—much as an unlucky person would be in a falling elevator on Earth. Low Earth orbit is said to be “halfway to anywhere” in the solar system. Even though a spacecraft in LEO is still deep within the grip of Earth’s gravity, there is some truth to the statement. The 7.7 km/s velocity imparted to the spacecraft gives it some of the kinetic energy required to climb further out of the well, representing 70% of the velocity (and half the energy) needed to escape. A more serious problem is that Earth itself is deep within the well of solar gravity. To go outward means climbing a hill. To go inward means first reducing velocity (takes rocket juice) to start falling toward the Sun, and then slowing down again (more juice) at the destination after picking up speed from the “downhill” ride. Let’s look at the gravitational potential energy well in the solar system to get a feel for the size of the hills involved. 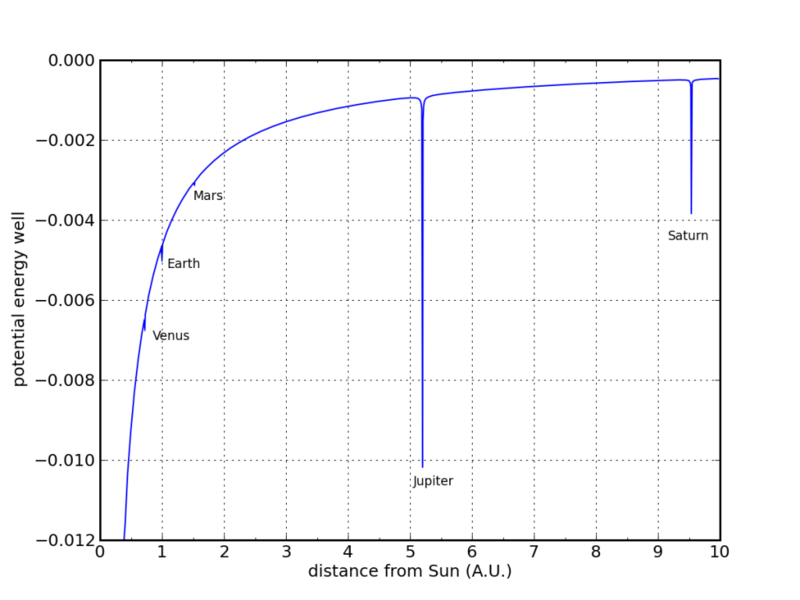 The blue line is dominated by the solar potential (goes down to −1.0 at the solar surface; not shown), but has little pockets made by the planets. Each pocket goes down to the respective planet’s surface. Mercury is off the plot to the lower-left, but Venus and Earth are visible (Earth at 1.0 astronomical units, or A.U., from the Sun), and Mars barely shows up. Jupiter’s well is the most dramatic, followed by Saturn’s. We live on the steep part of the hill, and Earth’s little dip is dwarfed by the climbs/descents to our neighbors. But the potential energy graph by itself is misleading, being only part of the story. For instance, we travel around the Sun at a velocity of 30 km/s, while Mars sails at a more sedate 24 km/s. So to meet up with Mars, we have 6 km/s of extra velocity to burn, helping us up the hill. We speak of this as a Δv (delta-vee) adjustment to trajectory. In just the same way, a spacecraft in LEO has in the bank 7.7 km/s of the 11.2 km/s needed to escape Earth for good. Then it’s on to fight the Sun. The next plot puts this in perspective, albeit only in simplified, approximate terms. The bottom of the plot represents the Earth’s ground. It takes 7.7 km/s of velocity to get to LEO (actually, it takes the equivalent of about 9.5 km/s because much effort is expended just climbing out, in addition to establishing the orbital speed). At 11.2 km/s, we’re free to take on the solar system. The plot is based on minimum-energy Hohmann transfer orbits. Each planet is represented by three dots: the top one being outside the planet’s grip in an identical solar orbit, the next one down at low-planet orbit (akin to LEO), and the lowest represents being at rest on the surface. For Saturn and Jupiter, these surface points are off the chart—so taxing is this requirement. And for these two, there’s no “there” there anyway to land on. Crudely speaking, we must have the means to accomplish all vertical traverses in order to make a trip. For instance, landing on Mars from Earth requires about 17 km/s of climb, followed by a controlled 5 km/s of deceleration for the descent. 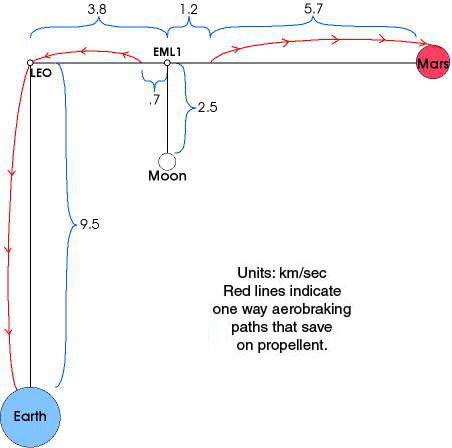 Thus it takes something like 20 km/s of capability to land on Mars, and LEO is approximately half the battle. Similarly, it takes about 20 km/s to get to the asteroid belt at 2–3 A.U. LEO is a good deal less than halfway to Mercury, Jupiter, Saturn, and beyond. This is especially true if one wants to enter orbits around the giants. where the final piece is the natural logarithm of the ratio of initial spacecraft-plus-fuel mass to the final mass of the spacecraft after the burn. For small burns, the velocity acquired is proportional to the mass of spent fuel. Since the total energy expended is also proportional to the same, energy expended scales with delta-v, making delta-v a useful measure. For larger burns, though, the non-linearity of the logarithm comes into play. Somewhat counter-intuitively, it is possible to get the rocket moving faster than the exhaust velocity once the fuel mass exceeds 63% of the total initial mass. In order to get delta-v values in the 20 km/s range when the exhaust velocity is less than 5 km/s requires almost nothing but fuel. See the Appendix for more on this. Since the large delta-v’s required to get around the solar system require a lot of fuel, and we have to work hard to lift all that fuel from the Earth’s surface, could we just grab hydrocarbons from Jupiter or Titan and be on our way? Let’s say you arrived in Jupiter orbit running on fumes, relying on the gassy giant to restock your coffers. In order to get close enough to Jupiter, you’ll be skimming the cloud-tops at a minimum of 42 km/s. Getting 1 kg of fuel on board will require you to accelerate the fuel to the speed of your spacecraft, at a kinetic energy cost of 885 MJ. The energy content of methane is 13 kcal/g, or 54 MJ/kg. Oops. Not even enough to pay for itself, energetically. Get used to Jupiter. And I have completely ignored the fact that you need marry two O2 molecules to each molecule of methane, meaning you actually get only 11 MJ per kilogram of total fuel. Utterly hopeless. We could come to a full stop to gather giant amounts of fuel at no kinetic energy cost, and then power out. But Jupiter’s potential well is so deep that the efficiency of energy delivery suffers mightily. Well—what about Titan? It’s a smaller body, and somewhat far from the grip of Saturn. From the surface of Titan, it takes 2.6 km/s to escape the moon, then another 2.3 km/s to escape from Saturn. So about 5 km/s total to end up in a Solar orbit at 9.5 A.U. Add another 15 km/s to get the fuel back to the inner solar system, if that’s part of the plan. As we saw above, the methane/oxygen mix delivers about 11 MJ/kg. If we could perfectly turn the energy of combustion into rear-directed exhaust of the reacted fuel, we would calculate the exhaust velocity by equating the thermal energy available with kinetic energy of the exhaust: E = ½mv² to find that each kilogram of fuel can attain an exhaust velocity of 4.7 km/s. Note that this ideal rocket engine would be cool to the touch if all the energy was transferred to exhaust kinetic energy. We’ll take 3 km/s as a more realistic number (this may still be high: good rocket fuels deliver 3–5 km/s, and methane is not a top choice for rocket fuel). Using the logarithmic rocket equation, we find we would need an initial-to-final mass ratio of 5.3:1 to reach 5 km/s, or 750:1 to deliver the fuel back to the inner solar system. In the first case, we necessarily deliver less than 20% of the tank capacity to the environment outside Saturn’s grip. In the second case, the tank arrives about 0.1% full. If you sent a 6,000 gallon fuel tanker truck to the refinery and it came back with 8 gallons, you might be pretty steamed and consider the trip a wasted effort. If you wanted the Titan Tanker to be able to get back to the surface of Titan for another refill, you need to leave enough fuel for another 5 km/s expenditure. Now the tanker can only offer 3% of its capacity to the waiting customer—who was until this unwelcome news enjoying a view of Saturn’s rings. This scenario pre-supposes that we can find oxygen on Titan, so we can arrive on the surface light and empty. If we had to carry oxygen to Titan from the inner solar system, the energy cost balloons to absurdity—as if it was not there already. Now on to getting materials from asteroids. I will assume that we want the resources to end up somewhere else in the solar system, so that we must move the mass across the potential well. The asteroid belt is over 20 km/s away in terms of velocity impulse. If the goal is to use the raw materials for production on Earth or in Earth orbit, we have to supply about 10 km/s of impulse. We would probably try to get lucky and find a nickel-metal asteroid in an unusual orbit requiring substantially less energy to reel it in. So let’s say we can find something requiring only 5 km/s of delta-v. Our imagined prize will be a cube 1 km on a side, having a mass around 1013 kg. This is very small for an asteroid, but we need to moderate our ambitions. From a resource point of view, it’s still a lot. To get this asteroid moving at 5 km/s with conventional rocket fuel (or any “fuel” that involves spitting the mass elements/ions out at high speed) would require a mass of fuel approximately twice that of the asteroid. As an example, using methane and oxygen, (4 kg of O2 for every 1 kg of CH4), we would require two years’ of global natural gas production to be delivered to the asteroid (now multiply this by a large factor for the fuel to actually deliver it from Earth’s potential well). The point is that we would be crazy to elect to push the asteroid our way with conventional rockets. So let’s use a solar sail! A big sheet of aluminized mylar would deflect solar photons and provide propulsive force. It works out that the momentum flux (pressure) from 1370 W per square meter (solar flux at Earth) is just 1370/c Newtons per m², where c is the speed of light. A Newton is about the weight of an apple. In our case, this calculates to 4.6 micro-Newtons per square meter. Right: you’ve never been knocked over by the sun. Even squirrels are safe. Solar wind pressure is orders of magnitude weaker still. Big mass, small force per unit area. We’re going to need a big sail. Let’s try to make it the area of the Earth! I’m not kidding around here. 1014 square meters, baby! At a thickness of 25 microns, the mylar would have a mass of about 1012 kg. Hmmm. If we had a way to get this much mass off the Earth, we wouldn’t need to mess around with solar sails in the first place. So let’s tone it down a bit: I’ll go with an Egypt-size sail 1012 m² in size—which is still 10,000 times the launch mass of a fully-loaded Saturn V rocket, to humble us. The acceleration of our 1013 kg asteroid, using Newton’s F = ma comes to about 50 nano-g (g ≈ 10 m/s²) It takes 350 years to reach 5 km/s. At least it can do it, given great patience. But there are big problems. Even if we could conceive of an Egypt-sized solar sail (difficult for me to swallow), orbital maneuvers don’t generally have the luxury of time. As the asteroid approaches Earth, it needs to be slowed down during the fly-by, otherwise it will just, well, fly by. I may not have exhausted the possibilities, but I’m personally exhausted. I had never worked through these computations before, and took my typical approach of estimating obvious, brute-force solutions to a problem. When such things do not work out, it sends up a red flag that maybe this thing isn’t so simple. The ideas sound good, but are easier said than done. It looks to me as if the resources of space are effectively stranded in place. I have stayed away from the commercial aspects of the problem. If the energetics don’t work, economics can do nothing to save it. No materials of intrinsic value (other than value from rarity) has been brought back from space—and certainly not in any economically advantageous way. It is noteworthy that NASA, ever existing under budgetary pressure, has not developed a viable commercial draw into the solar system. It is not for lack of talent, incentive, and technical capability that such a transition has not happened. I still support the economics of space-enabled science. Some of our most precious knowledge of the nature of the Universe comes from space missions and observations. Keep that train rolling, by all means! But such endeavors are unlikely to fall outside of the public funding model. The original post on space was not as quantitative as most Do the Math posts are, so I felt I had some unfinished business. I conclude with a reminder that the space angle is a distraction to the resource problems we will face on Earth this century—chiefly in the energy domain. I enjoyed doing the calculations, but at the same time feel that I could have spent my time on more meaningful and productive pursuits, rather than evaluating fantastical schemes. 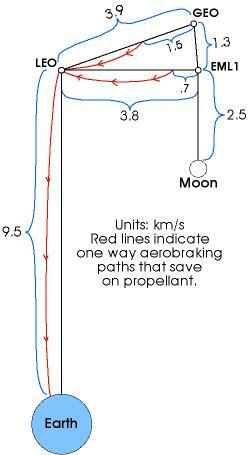 For the brave/curious, I include here a mathematical description of the ideal rocket. Not part of the main post, so stop here if you’ve seen enough. I won’t go through a full derivation, but will hit some of the key points. The basic approach is conservation of momentum. A rocket ejects some small nugget of mass (a molecule, for instance) at high speed. We will describe the total mass of the rocket before the ejection as M + m, ejecting mass m so the remaining rocket has mass M. The rocket travels at velocity V before the ejection, and the nugget is ejected at velocity v relative to the rocket (so V − v in the global frame: the minus sign because the nugget is directed opposite the forward direction of the rocket). After the ejection, the rocket will be traveling at V + ΔV. Velocity vectors before and after a rocket traveling at velocity V ejects a fuel "packet" at relative velocity, v.
The momentum before the ejection is (M + m)V, and after the ejection the combined momentum is M(V + ΔV) + m(V − v). 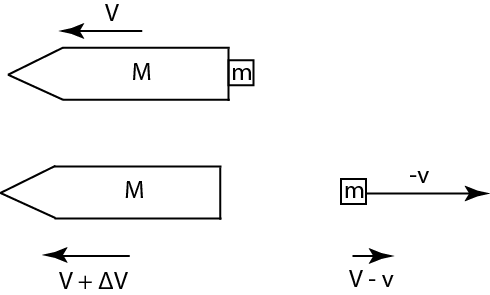 Setting these equal to each other (conservation of momentum), we find that ΔV = (m/M)v.
Integrating this process step by step and starting the rocket from rest leads to the logarithmic result that V = v·ln(Mi/Mf), relating to initial and final masses of the rocket-fuel combination. When Mf is close to Mi (i.e., not much fuel spent), the logarithmic term just turns into the ratio of fuel spent to the total mass. But that’s basically just ΔV = (m/M)v again. Looking at energy in our ejection scenario, the energy before ejection is Ei = ½(M + m)V². After ejection, we have two pieces to track, and the total energy is Ef = ½M(V + ΔV)² + ½m(V − v)². Working through the algebra, the change in energy is ΔE = ½mv²(1 +m/M), independent of the velocity, V, of the rocket. In other words, the energy changes by the kinetic energy of the ejected particle in the frame of the rocket times a small correction that we can ignore since m/M can be made arbitrarily small (like a molecule compared to the entire rocket). This is the basis for saying in the main post that the energy expended in a burn is essentially the kinetic energy of the spent fuel mass. In detail, how much of the energy goes to the ejected fuel and how much to the rocket depends on the rocket velocity. At first, when V ≈ 0, almost all the energy in Ef goes to the second term (ejected piece). At the moment when V = v (when Mi/Mf = 2.71), all of the energy goes into the rocket kinetic energy, and the ejected lump ends up stationary (no kinetic energy). Later, both the rocket and the fuel share the kinetic energy pie as the ejected fuel moves in the same direction as the rocket after expulsion. As an interesting aside, the fraction of energy expended by the rocket that actually goes into kinetic energy of the rocket—thus a measure of efficiency—starts out very small, and reaches a maximum value of 65%. The fueled spacecraft initially has total mass Mi, and after the burn it has mass Mf, meaning that the amount of fuel burned is ΔM = Mi − Mf. The final kinetic energy of the spacecraft is ½MfV², which can also be represented as ½Mfv²ln²(Mi/Mf) using our rocket equation. Meanwhile the amount of energy expended in the burn is ½ΔMv² (just summing the individual ½mv² contributions derived above). Taking the ratio of the two (note the cancellation of v²), we find an efficiency of delivering kinetic energy to the spacecraft that looks like ln²x/(x − 1), where x is the ratio Mi/Mf. For a while, the efficiency tracks ΔM/Mi, but reaches a peak of 0.65 (65%) when ΔM/Mi gets to 0.8 (Mi/Mf ≈ 4.92). To be clear, this has nothing to do with the efficiency of the rocket engine itself. Even a 100% efficient rocket engine that could eject spent fuel carrying away the entire heat of combustion (rocket engine/nozzle cool to the touch) would incur this efficiency hit in terms of transferring propulsive energy into kinetic energy of the spacecraft. I found this to be academically interesting. This entry was posted in Energy, Space and tagged resources, rockets, space by tmurphy. Bookmark the permalink. If you feel inclined to continue doing posts on space, might I request one on interstellar travel? I did some back-of-the-envelope calculations some time back and figured it would require at least an entire year’s worth of current energy production to get a Shuttle-sized ship to Proxima Centauri in a decade. Science fiction loves to play with interstellar colonization, including generation ships and sleeper ships. But you need tens of thousands of years worth of energy to keep a generation ship going for tens of thousands of years — and, if you can survive for so long without need of a solar system, why bother going to another one in the first place? Ten thousand years ago, our ancestors were just figuring out the whole agriculture thing. Sleeper ships are no better; gasses will escape from tanks over that timespan just as they will from a balloon, and plastics and rubber will rapidly deteriorate. You need a bare minimum level of industry just to keep the “stasis chambers” from deteriorating. Suddenly, you’re right back where we started with generation ships, as there’s not that much difference in continuous energy output required for either compared to the total energy requirement. What portion of stellar output would a ship the size of the Enterprise need to make a 20-light-year relativistic journey such that the crew only experienced a few months of travel time? How much energy would be needed for any (if any) of the wormhole-type options that have yet to be definitively ruled out? I agree that commercial exploitation of space isn’t likely, but I think you’ve missed out a big part of the discussion; space-based solar power. Few advocates of the industrial development of space want to bring minerals from elsewhere in the solar system to Earth; more commonly they want to use them to assemble solar power plants in Earth orbit and beam the power back down with microwaves. It would be nice to see an analysis of the viability or not of this, and its physical limitations. If the goal is to get power to Earth, the materials will need to be brought to Earth orbit, which is the framework I described. You only discussed bringing giant lumps of rock to Earth orbit in one push, not bringing only as much material as you need, manufacturing solar panels with it, and recouping the energy invested over the lifetime of the panel. I appreciate what you are saying, but the critical factor here is not the time it would take to bring a 1 cubic kilometre asteroid to Earth (at a pinch, you could use aerobraking, although you would scare the crap out of everybody!) but whether the energy returned from an orbiting solar panel would be worth the energy it takes to catapult just the building material for that panel. Seeing as you don’t know in advance the size of the panels, you ought to do this on a kg-by-kg basis as you did for recovering gas from Jupiter. Only doing the calculation for a very large chunk of rock doesn’t seem a complete proof. You’ve already shown that, even with the Sun’s power, exponential growth is unsustainable anyway. If you found space-based solar power was viable it wouldn’t undermine your main argument. The ‘Energy Trap’ you referred to earlier probably applies as well, seeing as any space based solar power scheme requires a big investment upfront, with no return for a long time. Smaller chunks obviously take less effort to bring home, but it all scales, so the actual number does not matter that much. In other words, if I wanted to bring in something 1000 times smaller, I could get away with a much smaller solar sail (only 10 Saturn V launches) but still be stuck with 350 years. If you stay full scale on the sail, you end up with the catch having less mass than the sail, in this case. You can do smaller chunks, yes. But the economics (energy and financial) provides no apparent advantage. You haven’t addressed catapulting matter off the surface though – which is faster than a solar sail and uses no propellant as the host body (Moon or asteroid) balances the change in momentum. This is by far not the only suggested means of making the transport of resources around the solar system easier. By sticking to specific propulsion technologies, you are showing engineering limits rather than physical ones, and engineering limits are not necessarily hard limits. The only way I see to show a physical limit is to assume future engineers can convert electrical energy to kinetic energy at close to 100% efficiency (subject to conservation of momentum, I don’t think its excessive to rule out ‘reactionless’ propulsion ideas) and show it still wouldn’t give a sufficient energy return even then. One option you didn’t address was using the asteroid itself as reaction mass, say by solar powered mass driver ejection of nickle-iron slugs. The slugs are reaction mass, not deliverable product. Another option, complementary to the first, would be to deliver the asteroid in re-entry-shaped chunks, directly to the top of the atmosphere. That’s if you are planning to use the material on Earth. In both cases, there’s the issue of limited solar power available at the asteroid belt, as well as transporting the mass driver/solar panels to that distance. If one is patient, I’d think that that’s where a solar sail might be useful. Using the asteroid as the reaction mass is smart, it you can find the energy to ablate the metal and send it off at very high velocity. It is disappointing that you mislead your readers with straw men such as lifting round-trip rocket fuel from Earth’s surface, when the first few results from a trivial web search on “asteroid mining” will find much better options and additionally game-changing approaches such as ISRU. It is not my intention to mislead or erect straw man arguments. Many people satisfy their curiosity with “Do the Wikipedia,” whereas my modus operandi is “Do the Math.” So I ask simple and intuitive questions (therefore mainstream) that often start with “can’t we just…?” I then often apply well known and well-understood methods to solve a problem—seeing if the standard approaches can scale, for instance. I personally believe this is still a valid and useful service, as we need to understand the things that are simple to talk about but far from simple to carry out. Another way to put it is that it’s still useful to understand which intuitive “solutions” are not possible. In this article, I don’t say that asteroid mining will never work, or can never work. I simply point out how difficult it is to achieve by conventional means. If I thought this was common knowledge, I would not bother. But by taking the approach I do, if readers learn the art of estimation and some basic physics, I’m happy with the result. Misleading is the opposite of what I try to accomplish. Apologies if it backfires sometimes. Almost seems ripe for some satirical illustrations or short movies, but like you say, it’s a distraction and not worth our time or energy. Thanks for the post, and for the clarity on needing to focus on resource responsibility here at home. A much needed message. I agree that mining bodies other than the Moon or Asteroids in the near future is off the table. However, I can not agree with your conclusions concerning the feasibility of mining asteroids. The error in your analysis is in the fact that you make a poor assumption: you assume that mining asteroids could only be worth it if one were to target LARGE rocks… You use the example of a kilometer in size. To be fair, this is what “asteroid mining” conjures up in most people’s minds. However, this is NOT a necessary assumption. 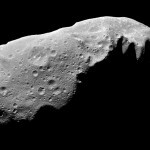 Further, not only does it not work from a thrust point of view, as you point out, it locks one into other poor assumptions about the shape of an asteroid mining effort: there are not that many large rocks out there: one km asteroids would require traveling far from the Earth, and require massive changes in velocity and trajectory. However, if we abandon the idea of massive rock, those other ideas can be abandoned as well. * Targeting massive rocks is not necessary. * Targeting asteroids that are large distances from the Earth is not necessary. * Targeting asteroids that are moving quickly relative to the Earth is not necessary. Apart from practicality: pumping large amounts of methane from other planets to Earth would be a near-suicidal messing with the global carbon cycle, which we have already thrown off balance by burning fossil fuels. This is a “solution” we really can’t afford. Great stuff Tom. You really got me with This Do The Math blog. I know biology is far from your home territory, but here’s an idea: apply your math skills and powers of deduction to estimate the natural carrying capacity of the Earth for humans, assuming no imput of fossil fuels and that there is sufficient energy directed to other organisms to support a sustainable ecosystem. – Gravitational slingshot maneuvers: using the gravity of a planet or moon to get a big gain in delta-v with minimal energy cost (though increased transit time). For example, NASA sent the Cassini probe on a spiral past Earth, Venus, Earth, and Jupiter, to get to Saturn with only about 2km/s of delta-v, rather than the 16km/s or so it would normally require. 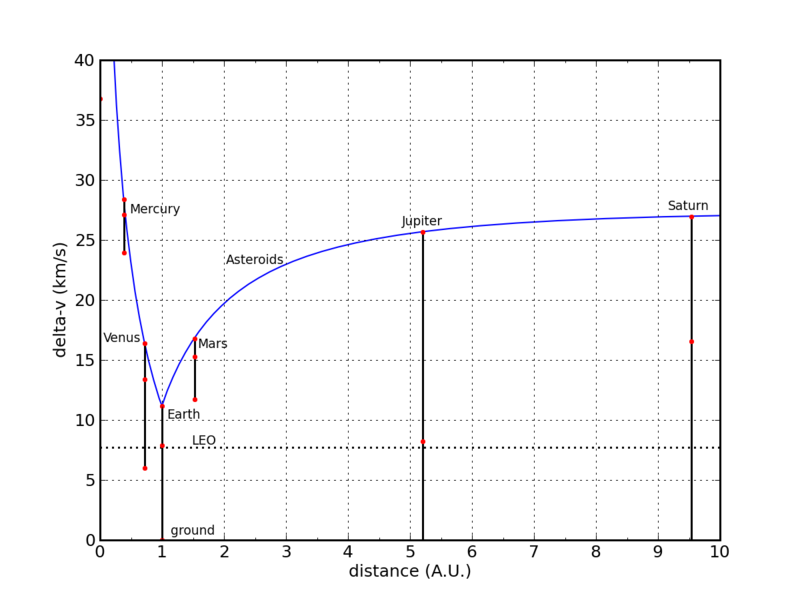 The momentum of the planet or moon is diminished by the amount that the probe’s momentum increases, but since the masses are so different, the effect on the planet’s speed is minimal. See Wikipedia entries “Gravity assist”, “Low energy transfer”, and “Interplanetary Transport Network”. – Aerobraking: if a planet or moon has an atmosphere (e.g. Titan) or is near a large body that has one (e.g. Saturn), you can use the atmosphere to slow your spaceship down, without needing to carry delta-v to make the downward part of the traverse. – Surface-powered launch: if a moon or asteroid is small enough and has a sparse enough atmosphere, you could build an electromagnetic mass driver on it and use it to launch the masses you are mining directly off of the body, without having to carry fuel with them. Obviously the mass driver needs lots of energy to accelerate its payload to escape velocity, but since you don’t need to carry fuel, the mass that you need to propel is greatly reduced. I’ve seen concepts for putting a mass driver on the moon which could directly propel ore nuggets into lunar orbit, and possibly all the way to Earth. Good points: I did not have time for the “tricks.” The slingshot approach is well-tested and appropriate if you’re not in a hurry. It’s like those bad itineraries you sometimes get stuck with for cheap tickets. And aerobraking is definitely a big help in slowing down at select locations. Even as a surprising number of the comments to you previous post on the subject did appear almost religiously blinded towards the rather clearcut arguments, I am impressed that you actually did go through the effort to quantify the challenges. The space around our planet is so vast and utterly an different environment from what anyone has ever experienced (very, very few aside) that the mental challenge is hard for even educated people with a grasp of the physics. I always look forward to your posts, so keep up the great work! How’d you get from 20 to 10? Pedantic note: there is one profitable space application, commercialized for decades: satellites. As mentioned, mass drivers might make more sense for the asteroid. And if world nickel resource is 1e11 kg, bringing home a 1e13 kg asteroid all at once might be overkill. By your calculation, bringing home a 1e11 kg asteroid via solar sail would take 3.5 years — not bad for doubling world supply, even if we actually have to double or quadruple the time for slowdown. Bonus if we can find platinum rich nickel asteroid. But solar or nuclear powered mass driver, either as propulsion for the big rock or to send it toward Earth in little chunks, may make more sense. There’s plenty of oxygen on Titan, locked up in rocks. Of course one would have to apply energy from somewhere to release it. But hydrocarbon is a nigh non-existent part of the space dream, I think; it’s usually about metals or He3 (more economically gained from the atmosphere of Saturn, perhaps.) Or Titan as a source of hydrogen for refueling fusion drives in books like _Imperial Earth_, I think. There’s also wanting mining for local use, like power satellites or space colonies. 20 is from the ground, 10 from LEO. I did not mention satellites as the obvious commercial enterprise, since these are not in the business of gathering space resources. I expect we’ll maintain a satellite infrastructure, even if we do not expand into space in a “big” way. Reducing the asteroid in the way you did to bring the timescale down makes the sail about as massive as the asteroid again (and let’s not forget that such a sail took 10,000 Saturn V to launch), so we’re not close to a realistic discussion here, in fact. What about manufacturing a solar sail in situ from asteroid belt materials? If you could construct a solar sail from each asteroid’s own matter, and maybe add some mass driver/slug propulsion to kick things off (or for faster maneuvering). Basically, my criticism is that any time you talk about launching huge quantities of mass from Earth’s surface you should self-reflect and decide whether you could instead launch a small manufacturing device to utilize in situ resources for that object. If we have the technology to create such small manufacturing devices (Molecular nanotechnology + advanced AI), wouldn’t the existence of that technology negate the need to go to the asteroid in the first place? Using such magical technology to extract metals, any metals, from asteroids is like using 2011 state of the art mining technology to extract rocks to make more hand axes. Just recently I had a casual discussion about growth and growing into space (with a physicist) and was similarly surprised to hear unrealisticaly bold statements. What about the (unproven) technology of space elevators? To what extend could this help? As I understand it, no practical material has yet been identified with the strength to support the space elevator cable. Steel is orders of magnitude too week for the job. Carbon nanotube/graphene ribbons are theoretically strong enough… and the rate of progress there in volume manufacturing is pretty remarkable. Sooner or later I think large scale structures from nano-engineered carbon will be possible (probably later, but maybe within this century?) – and this would allow space elevators if the current theories are correct. Even though the dream of “something extraterrestrial” being easily available for us humans to exploit is fascinating to exercise, I do hope that you will devote your time to more ‘realistic’ and down to earth considerations about sensible uses of available ressources with a minimal geo-environmental impact. Instead of spending time on the vast and practically infinite and inaccessible space around our planet, why not rather zoom in on practical solutions that can be useful for most of the plantets occupants. The human demography on earth will surely change in the years to come, and any credible directions towards a path that will enable a sustainable lifestyle (with growing or shrinking human populations) will surely be more worthwhile than the fantastic escape routes favored by those who encourage You to do their math. By doing the math (and physics) right, it should surely be possible to have a sustainable human population on earth – even at an advanced mental(!) stage as we pride ourself of having achieved today!? I’d love to see the Moon (the one body we’ve reached) added to your second plot. I think it’d be a good reference for the delta-v needed to reach Mars which is the talking point these days. See http://en.wikipedia.org/wiki/Delta-v_budget for a comparative delta-v link budget to the Moon or to Mars. Near earth objects are asteroids that are within the orbit of Mars. The delta-v to return from them are usually quite small, sometimes as low as 60m/s, using aerobraking on Earths atmosphere (substantial reentry shields would be required). The orbital phasing can be problematic; once rendezvous has been achieved, low delta-v return windows can be fairly far apart (more than a year, often many years), depending on the body. However, the delta-v to reach them is usually rather higher, over 3.8 km/s, which is still less than the delta-v to reach the moon’s surface. In general bodies that are much further away or closer to the Sun than the Earth have more frequent windows for travel, but usually have larger delta-v’s. Hi Tom, great posting and interesting stuff (consistent with the whole blog to date!). This side note I have is now a number of years out of date, but a contact of mine that had gotten close to the small circle of space entrepreneurs (elon musk, jeff bezos, et. al.,) were said to be pursuing the venture as they had come to understand (I.e., BELIEVE) that the reason for commercializing space was that the first company to successfully mine an asteroid would produce the earth’s first trillionaire. For all the reasons I read your blog I don’t agree with the notion – but at face value it does begin explain why a handful are so taken with the idea of space commercialization. This is an extremely informative article, thanks. I’m curious: do the ITN orbits allow for the possibility of much slower but less energy intensive orbits? My naive assumption is that they’d be useful for the return leg of the journey at the very least, saving on the energy budget and allowing for preprocessing or even manufacting work during the return trip. Why on Earth (pun sort of intended) would you start your use of asteriodal materials by going to the belt? A _much_ better choice of target (for your first missions, anyway) would be to target Earth approaching asteroids. The return delta-v, which is the important one since it is on the return that you have all that extra mass, from generic Earth approachers is given as ~1km/s (source: http://www.nss.org/settlement/asteroids/sonter.html). There are at least 5 such asteroids with a return delta-v of less than 400 m/s of which 1982DB has a 60m/s(!) return delta-v (source: http://www.nss.org/settlement/nasa/spaceresvol3/asterres1g.htm). Utilizing Earth approaching asteroids has the added benefit that it is precisely these asteroids that pose the greatest threat to Earth. Whatever asteroid you will want as your target, using chemical motors to get there and back is a perversely sub-optimal choice. If you are going to be doing things in trans-lunar space there are many motors both proposed and, in some cases, actually flown, that have vastly better Isp than any chemical engine will give you. Many of these are various flavors of electric propulsion, usually solar electric or nuclear electric. Also worth consideration are plasma sails. In addition, Hohmann trajectories are not always the minimum delta-v possible, if you are willing to trade time for delta-v, weak stability boundary trajectories will reduce the delta-v needed, while making the Hohmann alternative look speedy by comparison. Also, if a 1km^3 asteroid is inconveniently large to bring back, there are at least a couple of ways of dealing with this. One is to do processing in-situ and just bring back the refined material, using this approach you can just take as much as is convenient to move. Another approach is to select a smaller asteroid, there are orders of magnitude more small asteroids than big ones, asteroid numbers follow a power law distribution. Are any of these earth-crossing dudes something other than rock? Any metal-types in that mix? We don’t have spectral typing for 1982DB when last I heard, or for most of the other very low return delta-v asteroids. For Earth approachers in general, you know that at least some of them are going to be the kind of iron-nickel type that you are looking for since meteors, by definition, have to come from Earth approaching asteroids and some of them (most famously the one found in Barringer Crater) are iron-nickel. Why do you want a metal asteroid so badly? A rocky asteroid would give you glass and silicone to build space structures, silicon for computer chips and solar cells, oxygen to breathe, and water to drink. This article proves that using chemical rockets is bad past LEO. Soooo, what if we created a craft that was sent up in parts to LEO and docked next to the ISS. No more trying to launch the whole thing EVERY time. This of course would use something like the VASIMIR engine and probably a nuclear reactor, I think it might be the best propulsion that is currently out there beyond chemical. Perhaps you could do a quick math on this idea for getting around near earth space. But, it is a distraction from the real problems of Energy we do face on the planet. From my perspective these two ‘space’ posts of yours, and the other one of Stross’s that I found through your link, are by no means a waste of time. Despite the fact that I spend most of my time focussing on earthly energy/environmental issues, I have been guilty of thinking from time to time “Space! Land of opportunity and fortune, bounty for all – asteroids! For… you know… mining!”. I still think there are strong motivations for a space presence (research, communications, perhaps energy one day, astronomy… and my personal favourite: armageddon/deep impact style missions to knock dangerous asteroids off course). But as a release valve for the earth? Not a shadow of a chance with current technologies. It’s not a matter of failing with a hamster but wanting a pony. The reality is that with todays reach and technology, even assuming highly speculative not-yet-available mid-term possibilities, there are no ponies. Which is not to say I’ve lost all hope of one day fanging around the galaxy as a devil-may-care handsome rogue adventurer… just now I accept that I’ll need a warp-drive-equivalent technology for it to be realistic. I’ve no idea what the current status of warp drive research is, but I think it’s fair to say that making it a core feature of our growth/environmental/future strategy from now is a pretty poor approach. p.s. I note however that you’ve failed to assess the commercial returns of unobtanium mining on 4.5LY remote jungle paradise’. Sloppy. Please don’t be despondent about the Space Destiny responses to the “Stranded Resources” and “Why Not Space” posts. Thanks for taking the time to do the math and sharing it with us. I grew up in the same era as you and just assumed that the Apollo era was the beginning of a grand progression, then was initially perplexed and flustered when it all ground to a halt after Skylab. So, while the romantic in me would love to see domed cities on Mars, and square-jawed space pioneers fueling up their cruisers on Titan, I realize that, due to the physical and economic constraints you elucidate so well, this must remain confined to guilty summer movies. Instead, I am thrilled that we’re lucky enough to get space telescopes and robotic humvees on Mars. It’s been a great few years for unmanned missions, and I hope that does continue. The scientific value is enormous, while the commercial value (beyond geosync orbit) is approximately nil. As others have noted, asteroids come in all sizes. More to the point, they come at a wide range of delta-Vs too — many of the Earth-crossing asteroids are much “closer”, in terms of energy, than asteroids from the main belt. A space elevator is not a realistic option, but space tethers may be. Consider a tether 5000 km long, with its lower end hanging 300 km above the Earth. “5000 km” sounds like a lot, but actually this is doable with current technologies — the tensile strength required is comparable to kevlar. You launch payloads on suborbital trajectories to the lower end of the tether; they’re then winched up the tether to the high end, where they’re released to a much higher orbit. This isn’t a magic bullet* by any means, but you end up with payload/mass ratios roughly double what are available today. *Robert Zubrin first came up with this idea, under the title “Hypersonic Skyhook”. Zubrin is, frankly, a bit of a nutcase — but blind pigs and acorns; there’s no obvious reason this wouldn’t work. At the level of fundamental elegance, you can’t beat tethers: instead of throwing away momentum in exhaust, you just keep re-using it as payloads are slung around — assuming tethers at all sources/destinations and an abundance of payloads. Before that, make-up energy could be supplied by spinning up tethers slowly with a low-thrust solar-electric or nuclear-electric drive. Re the earlier comment that making bulk quantities of carbon nanotubes is progressing rapidly: no, it’s not, despite some extravagant projections. The physical chemistry of getting all-but-perfect nanotubes longer than small fractions of a mm is a bear; the nano-process engineering of turning their native spaghetti tangle into aligned bundles will be a whole family of bears. To get to the nanotube-stayed Gibraltar Bridge (let alone a space elevator) could easily require time and investment comparable to the journey from Bell Labs’ 1947 transistor to a 2011 IC fab plant. I don’t follow the first point about not throwing away momentum in the form of exhaust in a tether system. Without throwing away momentum, you can gain none (and go nowhere). If stranded on a frictionless lake on a sled piled with bricks, the only way off is to hurl bricks away. If the bricks are tethered to you, you may be able to move about as mass is redistributed, but the center of mass will be in the same place always. First of all, I’ve to premise that I totally agree with your point that we first must somehow resolve the problem of transitioning to a steady state economics and that space resource exploitation does not help in this basic step. But, *if* we will manage this transition and we will approach the problem from a non-romantic practical approach, it’s likely that it could help alleviate the strain even a steady-state economy does put on Earth resources. I said non-romantic because I think that, in absence of radical technological advances, our best road to resource exploitation, like to scientific exploration, is the robotic approach. The massive use of robots would allow us to use a lot of tricks to reduce the impact of the energy wells, like using mass drivers for initial launch, sending things and components in multiple pieces and assembling at destination, taking the long, slow routes etc. etc. The point, always after the transition to a new economy, would not be to do energetically efficient manufacture and energy production, as I doubt we could ever then beat the efficiency of doing things down here, but if we managed, after the initial investment to create the infrastructure, to kickstart a mostly autonomous production cycle in space, then we could offload the strain of many industrial activities now taking place on Earth itself, including the waste heat associated to that. The network consists of very low energy orbits that connect the various Lagrange points in the solar system. I guess these orbits take full advantage of gravitational slingshots and many-body dynamics, so the delta-V required from the spacecraft itself is relatively small. The downside is that these orbits are very slow and may require accurate maneuvers at critical points, which may be bit difficult when you are towing even a small million ton asteroid. I remember being a total space cadet. What changed my mind wasn’t so much the energy required in moving stuff around between worlds, because I never thought about a future in space where massive amounts of stuff needed to be moved. You could start small and then bootstrap and grow your space industry exponentially. You don’t need to move people or stuff around for that, I mean if we really wanted we could solve the global warming issue no need to move off the planet, or so I thought. Since I heard about the more energy centric view of our world (Georgescu-Roegen) I had to reconsider. The main thing is, I totally forgot that resources need to be concentrated to be extracted efficiently. Also annoying is that we distribute concentrated resources over the earth in the process of using them (miniaturization is evil). So when you are on the moon you have access to unfiltered sunlight which should get you a better EROI of solar cells or heliostats plus associated industry. This however is offset by the lower concentration of ores since there is no water on the moon to cause hydrothermal concentration to happen, even though there should have been enough energy. Great post. Understanding of the gravity wells around Earth and the energy requirements for moving mass in space is very important for anyone who is seriously interested in space exploration. As a space exploration advocate, I’m sad that you feel that you are wasting your time doing this math, but I’m glad that you did it anyway. This kind of educational stuff is, in my opinion, quite valuable to have on the internet in order for people to have realistic ideas about space. Space exploration can never succeed without (enough) people having a realistic picture of the challenges. However, one point about “commercial viability”: as long as laws of physics and resources are not insurmountable constraints (as seems to me to be the case with space exploration), commercial viability is a cultural, political and psychological matter, and as such, space exploration can be commercially viable as long as it can be politically, culturally and psychologically viable. Isn’t it the case that if something can get funded (be it by the state or by private money), it is commercially viable regardless of its energy return on energy invested? At least, such would seem to be the case for any activity that the economy which produces the funding does not rely on for its functioning. If we put a premium on nickel from space: “My battery uses nickel from space!” then the psychological, cultural, political impetus might be satisfied, and people would pay a higher price. But I think you’re talking about science missions that have traditionally been performed via government funding. So I suppose it’s possible to fundraise specifically for this. For my money, I’m happier giving to the government then being pestered by phone calls and e-mails for every possible cause. I think you’d accomplish far less science if you tried to privatize it or rely on targeted donations. >I think you’re talking about science missions that have traditionally been performed via government funding. I just mean that even bringing some rocks from the moon to Earth can be “profitable” if a government with access to enough resources makes it so by policy. And that goes for other stuff in space too, such as nickel or whatever, as long as physics, technology and resource limits don’t prevent it. So space mining could probably be made into a “profitable” industry with political support. Governments, after all, don’t need to make a (monetary) profit with their programs. I don’t advocate government subsidized space mining though… I’d rather have a moonbase or a manned Mars program or something. I understand profit to be the remainder left after you repay / replace all that was needed to do the job. Government doesn’t really have any money or resources of its own – it all comes from the taxpayers. If government spends a $1T on space mining and returns $1B, it isn’t profitable simply because the gov’t says it is. The taxpayers have lost $999B that could have been spent here on Earth. It sometimes seems there is magic in gov’t accounting because the amounts are so huge that the repercussions aren’t felt for a generation or two. But the piper will get paid in the end. My point is that economics has “laws” similar to physics. A gov’t can’t violate those laws any more than a space program can violate the laws Tom has outlined. >If government spends a $1T on space mining and returns $1B, it isn’t profitable simply because the gov’t says it is. The taxpayers have lost $999B that could have been spent here on Earth. The government doesn’t have to say anything, it just has to buy (or subsidize in any manner), and those people that it buys from do profit from it. And many other people who are associated with those people profit too. So, your accounting seems to fail: you seem to think that the $999B somehow is not “spent here on Earth”. It is, it just gets “redistributed”. >My point is that economics has “laws” similar to physics. A gov’t can’t violate those laws any more than a space program can violate the laws Tom has outlined. I am not aware of any law of economics that prevents a government from buying (or subsidizing in any manner) goods and services with the resources it has. My understanding is that, in fact, it happens every day in vast amounts in this world. The main reason I don’t advocate space mining, though, is indeed that it seems like it would require too much governmental subsidy/redistribution for too little gain (except maybe in the very long term, and maybe not). And that would be problematic for cultural, political and psychological reasons – and that includes economics. Going through those calculations was a public service; it may not persuade those who are religiously faithful to the idea of near-term exploitation of space, but it will give others some arguments to use in the discussion. Numbers like these convinced me a long time ago that we’re not going into space (at least not beyond LEO) using rockets. Unmanned missions are fine, and will be made cheaper and faster by the next generation of ion rockets, but delivering people or industrial cargos by rocket is a non-starter. There are other possibilities, but they will require long R&D times to get to the point where they can be used routinely. 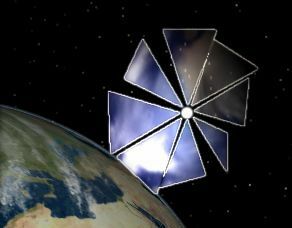 For instance, while a space elevator would require unobtainium in large quantities and would be vulnerable to collision with all the junk we’ve left in orbit, the smaller structures called pinwheels or whirligigs could be built with existing materials, and would operate lower down in LEO where there’s less junk. But I suspect that a lot of governments would be upset with anyone planning to hang a structure massing a few thousand tons in an orbit where it periodically dipped down into the atmosphere to within a few kilometers of the ground. That may be the biggest long-term obstacle to building large-scale systems for transport to LEO and GEO: most any such system looks like a weapon or a weapon delivery system if you squint just a bit. Or like a bomb waiting for someone to detonate it. >Numbers like these convinced me a long time ago that we’re not going into space (at least not beyond LEO) using rockets. But humans already have gone beyond low Earth orbit using rockets. I wasn’t even born when it happened, but I’ve read a lot about it. >There are other possibilities, but they will require long R&D times to get to the point where they can be used routinely. I’m all for space-oriented R&D, but I don’t think that trashing technology that is known to work, rockets, is necessary nor desirable. If something better is invented, surely they will get replaced in due time. Thank you for a very informative article. However, as some other commentators have already noted, I think you’ve forgotten ion thrusters and other more efficient space propulsion systems. These may be able to attain exhaust velocities in the 30-210 km/s range, and some have already been flight tested. The fuel requirements change accordingly. The primary reason we need chemical (or nuclear thermal) rockets is to get out from planetary gravity wells. Ion thrusters have such a poor thrust to weight ratio that they simply wouldn’t lift the spacecraft off the ground. But once we’re in orbit, you can just build up the acceleration bit by bit. As for asteroid mining, targeting near Earth asteroids and using part of the asteroid as a reaction mass for a nuclear- or solar-powered thruster may be feasible in the future. However, the primary reason I remain convinced that our destiny is in space is simply because whatever we do here on Earth, we’re simply buying time. Our species and the planet is doomed whatever we do, even if we somehow succeed in transitioning to a steady state economy. Sooner or later, some terrestrial or cosmic catastrophe will wipe us out. As far as we know, that would mean the death of consciousness in this part of the universe, which is a significant loss for diversity ;). Nevertheless, I don’t believe it will be humans (at least in a way we currently understand the term) who will leave the planet. I don’t know what they will be, but certainly better adapted to space than us meatsacks ever will be. I would recommend using something OTHER than low-efficiency chemical rockets for your analysis of moving mass around the solar system. For starters, and well within our reach of technology, would be ion thrusters. These are 1950’s level technology, and have been used hundreds of times in space, they offer far superior performance compared to chemical rockets. You don’t need to move as much reaction-mass out of Earth’s gravity well either, which is a huge plus. For instance, this type of Ion thruster offer an exhaust gas velocity of around 10-80 km/s, far superior to any chemical rocket. It can be powered by solar or nuclear. I argue that you need the right technology for the job, just as medieval sailing ships did not allow for a globalized, just-in-time overseas manufacturing of semiconductors and advanced aeronautics that are routine and commonplace today. I admit to overlooking ion thrusters. A 50 km/s ejection is indeed a game-changer over liquid fuels. Let’s can the talk and do the math: We can either use solar input at about 1000 W/m² across the square kilometer face of the asteroid used in our example all concentrated to vaporize the molecules of the asteroid and hurl them out at 50 km/s, or we could install a 1 GW nuclear plant on the asteroid (imagine that feat!). Either way, it’s 1 GW. 1 GW converted into a stream of particles ejected at 50,000 m/s is a flow of kinetic energy (½mv²) corresponding to a mass loss rate of 0.8 kg/sec (so small). This corresponds to a force of (0.8 kg/s)×(50,000 m/s), or 40,000 Newtons. F=ma yields 0.4 nano-g, or 100 times wimpier than the massive solar sail example. The areas involved are different, but even building a concentrator 10 times the linear dimension of the asteroid puts us in the same place we were before. Another case of easier said than done. Since this week’s post is essentially about mineral resources vs. energy costs, you might be interested in “The Age of Substitutability” by Goeller and Weinberg (1978). They argue that we can never really “run out” of usable mineral resources (with a few exceptions, e.g., P and CHx), provided we have enough cheap exergy* to harvest them at their average abundances in the crust and seawater. Both Fe and Ni are rather abundant in Earth’s crust (even when accounting for the composition of the core), which makes me wonder why we’d even bother mining Ni- and Fe-rich asteroids. Since exergy availability is a crucial limiting factor to any “universal mining machine” (and space colonization, for that matter), the real action lies in studying the quantity and quality of the energy resources available to human civilization, which is why I enjoy reading your blog. *I use Robert Ayres’ definition of exergy: the maximum amount of work that a subsystem can do on its surroundings as it approaches thermodynamic equilibrium reversibly, i.e., useful work. Query: Let’s change the question. Possible to reduce the huge negative returns? Canadian Rockies Using Digital Terrain Models”, C.M. Gold and W.E. Kilby. So your gram of coal+overburden could easily contain less energy than the helium 3 in one gram of lunar regolith. Oil and gas on the other hand…. The 10:1 overburden is useful information. Now what “delta-v-burden” should be applied for resources stranded on the Moon? Far easier to get through a mile of rock than up to the Moon. Well if you want to get the He3 down you may not need to take much stuff back with you. If you can agree with me that the fuel energy of a Saturn V lies around 56TJ you need to mine around 9.7 Megatons of moon rock to get 97 gram of He3. You could take much more He3 back to earth, also the 9.7 Mt aren’t so big by earth standards. The amount of easily available He3 lies around 60kt. The question is how much energy is needed to mine and process the regolith. Also a usable fusion reactor is lacking. I get 9.7 kton, not Mton, but you’d need to do significantly better than break-even to make it worth the time/effort/expense. 10:1 makes the EROEI look like solar (and not as good as wind). 100:1 makes it seem like a sweet deal (like early oil bonanza). So 970 kton of lunar dirt plowed up. This is an area 600 meters square, one meter deep. Maybe this sounds easy to some, but let’s not forget where we’re talking about here. There’s a lot more going on than straight up net energy return (lunar landing capability, unprecedented extraterrestrial mining operation at large scale, fusion (! ), launching a Saturn V every 5 minutes to supply today’s global power appetite, etc.). I’m not trying to rule this out as “can never, ever happen,” but it’s not to be considered a fix for this century, when we hit the fossil fuel crunch. And FWIW, I get that 60 kt of He3 gets us 100 years of energy at today’s 12 TW (for the price of processing the entire lunar regolith). No need to respond: this bone is chewed enough for me. In your delta V plot you show 8 km/s from earth’s surface to LEO. It is more like 9 or 10 since rockets suffer gravity loss during vertical ascent. Your plot indicates about 9 km/s from LEO to Mars. This is way off. It is more like 4 km/s. Once at Mars it suffices to make a burn that parks the ship in a capture orbit whose periaerion passes through Mars atmosphere. Successive drag passes will then shed velocity over time. Delta V from earth surface to Mars surface is more like 15 km/s. In one of your earlier blogs I mentioned Chandrayaan-1 detecting what seem to be massive sheets of ice in the lunar cold traps. The text explains the ~9.5 km/s to LEO and explains the plot as approximate. Aerobraking is not addressed (see other comments). 2 km/s vs. the 5 I used is no game changer. I think that this article focuses too much on the cost to get from one planet to another and doesn’t address the main question: once you land on the planet, can you build self-replicating structures so as to grow life on that planet? Have you read any of the papers by Klaus Lackner of Columbia University? If it is possible for robots to self-replicate on the Moon or Mars, why do you feel that we must be constrained to life only on Earth? If you don’t think that the goal of life is to expand to other planets, what do you think is the goal of life? I don’t think I’ve seen the feverish faith that we’ll end up colonizing space expressed any more plainly than in the last question. It is clearly shocking to anyone in this mindset that there could be another valid viewpoint. I am suitably stunned. As for self-replicating robots on other planets, I consider this to be hard-over on the reality-fantasy axis, given our demonstrated capabilities and the overwhelming practical challenges involved (mining, refining, machining, high-tech fab, access to water, chemicals, etc.). We can’t come close to automating this on Earth, and it gets unfathomably harder on a remote rock with no support infrastructure. Experiment, not theory, determines what is science—the real world imposing constraints our brains need not respect. You’ll naturally dismiss my point of view, judging by our couldn’t-be-more-divergent perspectives. I only let this through to paint the contrast for readers. I will not continue this thread. The first viable plastic to petro technology coming to market to help solve the plastic waste problem. John Bordynuik, CEO of JBI, Inc. (http://plastic2oil.com), shows how plastic came to make up a huge part of the world’s waste stream, and discusses the challenges and triumphs in recycling that plastic back into clean, usable oil. See the post: Garbage In, Garbage Out to see why this technique offers little real relief. Cute idea, but don’t let the hype fool you. Your numbers on solar sails are conservative. The first solar sail technology demonstrator, IKAROS, uses relatively heavy 7.5 micron sails. NASA and private industry developed 2 and 0.9 micron films for first generation solar sail missions. When developing an Egypt-sized sail, you might as well develop even thinner and lighter sail materials (see http://www.niac.usra.edu/studies/333Christensen.html). Basically, shave at least an order of magnitude off the launch mass problem. Also, if I were asteroid mining, I’d go for near Earth asteroids, perform some low level processing of asteroid regolith, and ship it with smaller sails. Still, doesn’t really change the overall answer.